Former President Jimmy Carter began a three-day visit to Cuba yesterday, amidst a stormy background of seemingly constant escalation and de-escalation of tensions between the U.S. and the island nation. On the first day of his visit, Carter met with leaders of the Cuban Jewish community as well as the Catholic Archbishop of Havana, Cardinal Jaime Ortega. The Catholic Church, which had a rocky relationship with Cuban authorities for years, began a dialogue with President Raúl Castro in 2010. The ex-president’s trip takes place during uncertain times for the island nation and its relationship with the United States. In what some consider the beginning of a thaw, the Obama administration loosened restrictions that President Bush had imposed on exchanges with Cuba, but tensions flared up again when a Cuban court sentenced U.S. contractor Alan Gross to 15 years in prison for crimes against state security. Gross, who received funding from the U.S. Agency for International Development, contends that he was simply trying to help the island’s Jewish community gain Internet access when he was arrested in 2009. Cuban Jewish leaders, however, deny having met Gross, and Cuban authorities charged that he was working as a “mercenary” on behalf of the U.S. to deliver communications equipment to U.S.-backed dissidents. 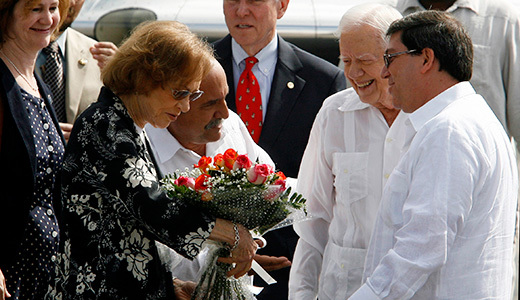 Carter was scheduled to meet with President Raúl Castro later today. Carter and Cuban leaders have said there are no plans to take up the issue of the Cuban Five, Cuban citizens who went to the U.S. to try to foil terrorist plots against Cuba. The five men are sitting in U.S. jails, convicted of espionage even though they committed no actions against the U.S. But some commentators have suggested Carter may push the Cuban government to release Gross on humanitarian grounds or to broker an exchange of prisoners. 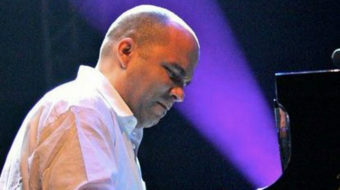 Bolstering the exchange theory is the fact that the lawyer who defended Gross in Cuban courts, Nuris Piñero Sierra, also represents the families of the Five. Another element in the mix is the case of CIA operative Luis Posada Carriles, who is on trial in El Paso, Texas. Carriles, who masterminded the downing of a Cuban airplane, killing 73 people, and terrorist attacks against Cuban hotels and tourist areas that led to the death of an Italian tourist, is not on trial as a terrorist, but for lying to U.S. immigration officials. Nevertheless, Cuba, which wants Posada extradited either there or to Venezuela, has given major press coverage to the proceedings. Carter’s visit comes just before the next congress of the Cuban Communist Party, set to take place next month. Vigorous debate is ongoing across the island, as Cuba’s leadership plans to press for a new economic approach to socialism at the meeting, the highest decision-making body of the Communist Party. The transition, which borrows some elements from China and Vietnam, will be specifically Cuban, leaders say, and they are consequently encouraging more meetings than normal at the grassroots level. In those meetings, citizens are encouraged to put forward their ideas, fears and especially their complaints about how things are run. The opinions are to be compiled and summarized for the delegates elected to the Congress to better inform the decision-making process. While Carter’s trip is technically a private venture, sponsored by his organization, analysts say some sort of policy announcement, either from the Cuban side, the U.S. or both, is possible.